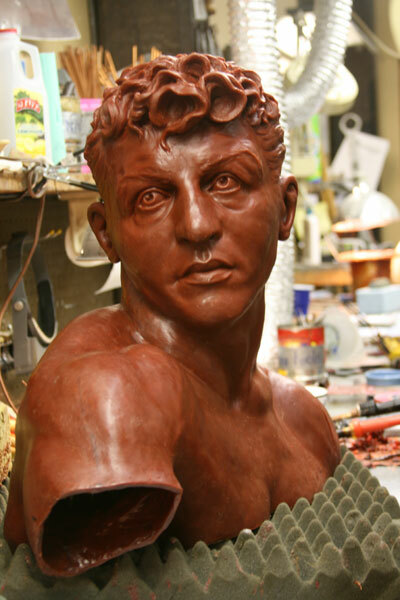 The larger-than-life-sized bronze statue of Joey Giardello took another step toward completion recently when a full-sized red wax version was cast at Laran Bronze Foundry in Chester, PA. The wax casting is considered the final step before the artwork goes live. The wax version allows artist Carl LeVotch to make any last minute adjustments necessary. LeVotch will fine tune the wax over the next week or two before turning the project over to the bronze artisans for the final stage. The Giardello statue is expected to be finished in the next month and a 2010 dedication date on Passyunk Avenue should happen before the end of the year.